The Miller Family purchased a 7 acre native bush block in 1924. It is now registered with the Queen Elizabeth Trust and has an open space convenant on it i.e. protected native forest. There is a labyrinth of bush tracks and an old dam on the property. The property is 7 kms from Piha Beach with beautiful bush and sea views over the Tasman Sea and Lion Rock. There is also another original bach on the property which is advertised under "unique bush property" Yes, you can even book out the 2 properties if you require larger separate accommodation. This fabulous new Retreat was designed by Chris Tate who won international acclaim for his "Glasshouse" in Titirangi. The decor is beautiful, you will watch the sun go down from the deck at night; and have an amazing peaceful sleep on the NZ made Cotton and Latex mattresses. The 2 queen-size beds are the only sleeping facilities - no fold-out or portable beds are provided. It has a special feel about it, with an outdoor kitchen sink and outdoor bath (with hot water). Heat pump installed, for extra warmth in winter. Fireplace available with firewood provided over winter months. Self catering. Webber BBQ on front deck (always cook with the lid down on a Webber). Also a rice cooker and slow cooker. With thanks to our special friend Ed Kanze for some spectacular photos on his last visit. This unique land has been in our family since 1924 and comes under the Queen Elizabeth Trust which provides extra protection to the rain forest. Managing the 2 houses, on our piece of paradise, is a shared job between 2 sisters, and supported by our nephew who lives on site. The Retreat was completed in 2010. It was built on the one clear piece of land in the entire property. The project included the wonderful Chris Tate, and a long process of approvals and building something very special to share was finally completed. We hope you enjoy it as much as we do. Because we want to share the experience of staying high in the rain forest with as many people as possible. 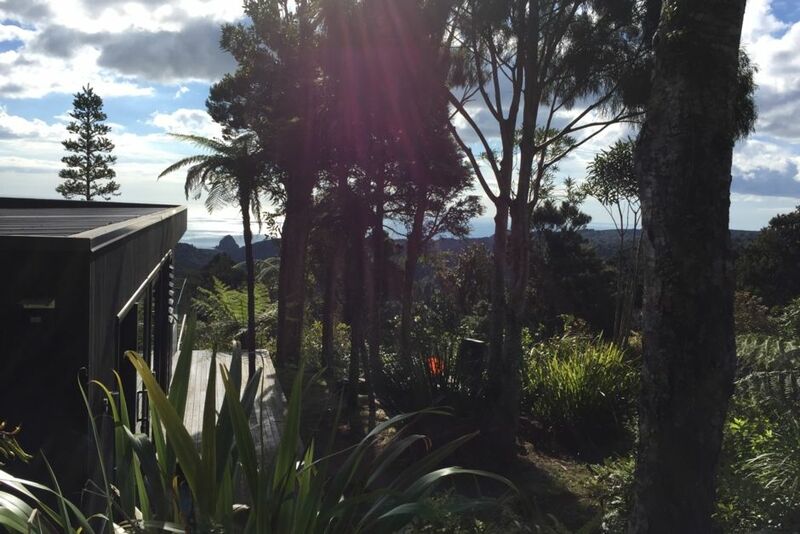 Architecturally designed Retreat house, the rain forest, the sunsets, the peace and quiet, wood pigeons, the view down to Lion Rock, the 15 mins drive to Piha Beach .... and so much more.